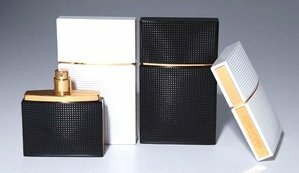 Mary-Kate and Ashley Olsen's Elizabeth and James brand will launch two fragrances for women, Nirvana White and Nirvana Black, in December. Nirvana White ~ a musky floral fragrance with peony, muguet and musk. Developed by perfumer Honorine Blanc. Nirvana Black ~ a sensual woody scent with violet, sandalwood and vanilla. Developed by perfumer Pierre Negrin. Elizabeth and James Nirvana White and Nirvana Black will be available at Sephora, in 30 and 50 ml Eau de Parfum and in a travel-sized rollerball. Update: see a review of Elizabeth and James Nirvana White and Nirvana Black. Interesting. A first for them? I think they nailed the name and packaging but we shall have to see on the juice. They had fragrances under the Mary Kate and Ashley label in the past, when they were much younger…these are under their Elizabeth & James brand, so not really celebrity perfumes. I’m curious if the Elizabeth in this brand name is for their younger sister. Elizabeth Olsen seems to be quite the serious actress and has played some interesting and quirky roles. Yes, E & J are their two younger siblings. Really like that packaging. They don’t sound mind-blowing, but then again, no cupcakes, pink berries or oud. Definitely worth a try. Ditto on the nice packaging, and it sounds as if the juice may not be a complete disappointment. Those bottles make me think of Chanel; very classic. Nice job! I’ve been very impressed with both their Elizabeth & James and The Row fashion lines. They really do have an eye for quality and style that goes beyond trends. Very curious to see if that translates to fragrances, as well. Nirvana Black sounds definitely worth a sniff. Will pass…and the bottles look like fancy Zippos to me. Hate to sound my age, but it’s hard for me to see “Nirvana” and not have the scent named after Teen Spirit or something!